​for teens is now in paperback!!! Click here to read a sample for free!!! "Smart, funny-but-ruthless teens and self-absorbed, grieving adults prove to be enormously appealing." "With whip-smart writing, a fast-paced plot, plenty of humor, and just enough mystery to keep readers on edge, this is an emotional journey about breaking free of family, friends, and duty to discover what makes you happy." "This funny, quick read hides a depth that readers will not see coming . . . a delightful read for high school students who have felt the pressure to be someone they are not." Higgs Boson Bing has seven days left before his perfect high school career is completed. Then it's on to Harvard to fulfill the fantasy portrait of success that he and his parents have cultivated for the past four years. Four years of academic achievement. Four years of debate championships. Two years of dating the most popular girl in school. It was, literally, everything his parents could have wanted. Everything they wanted for Higgs's older brother Jeffrey, in fact. But something's not right. And when Higgs's girlfriend presents him with a seemingly innocent hypothetical question about whether or not he'd give her a kidney . . . the exposed fault lines reach straight down to the foundations of his life . . .
"As Higgs' life unravels, every single one of his accepted beliefs has to be re-examined. And the miracle of this novel--the wonderful, hilarious miracle of this novel--is that Higgs actually does this. In a culture that insists that nothing matters more than appearance, Higgs actually looks at himself deeply and (and here is the killer in this novel) honestly." "I love Lisa Yee's writing! You read along, smiling and chortling all the way, and then WHAM! she hits you in the heart. 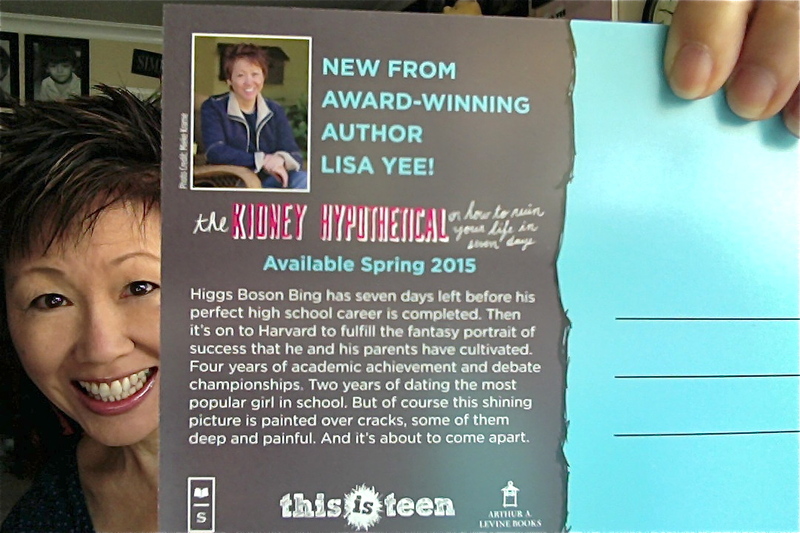 Watch out Higgs Boson, you're a Lisa Yee character. You've got seven days – seven days to shed who you think you should be, and become the person you're meant to be." "Lisa Yee has written the best worst week of school ever. Just when you think Higgs Boson Bing's life can't get any worse, it does, in increasingly funny and poignant ways." "Lisa Yee is one of those people everybody loves. At any moment, she can say something witty, completely off-the-wall wacky, or shockingly deep. Reading THE KIDNEY HYPOTHETICAL was exactly like hanging out with Lisa — wildly entertaining, emotionally affecting, and over far too soon." "Lisa asks what it means to live an authentic life, and she does so brilliantly with humor, pathos, and truth." To read HOW MY DAUGHTER'S INCIDENT WITH THE POLICE INSPIRED THE BOOK, click here. before we hit upon the final one . . .